Remember in the previous Supernatural convention posts how I talked about not sleeping because I was so excited…and nervous…and a giant bag of “holy shnikes this is gonna be the best experience EVER? !” Remember that? Yeah…well…after friday night karaoke, I PASSED… THE HELL… OUT. Like exhaustion induced coma. I’m pretty sure I didn’t move while I slept and waking up was a bit of a challenge. Once I remembered WHY I was getting up that early though…I shot out of bed and readied myself for day 2. Pee before I get there so I don’t pee my pants in front of a celebrity: Double check!! Walking from my hotel to the convention center I began checking my trusty highlighted schedule. Again…thanks a MILLION to whoever suggested I highlight all that. It made it SO much easier to plan out my day. The day started at 10am with an intro by Richard Speight Jr (Trickster/Gabriel). I wasn’t there for that part because at 10am… I had a date with the devil…. 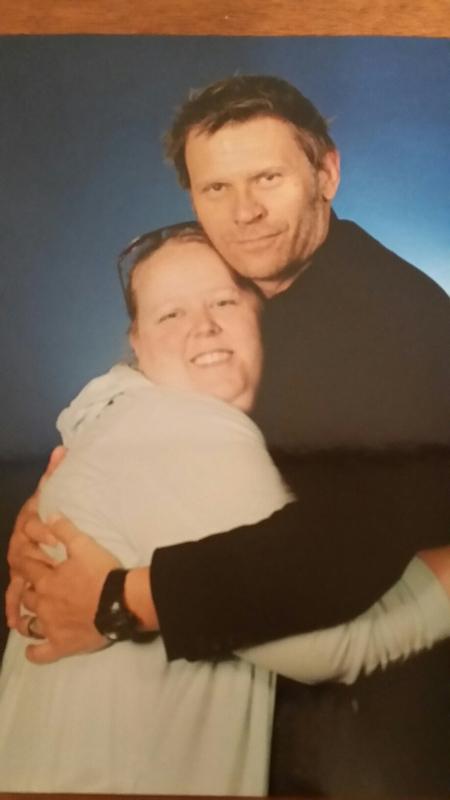 my Mark Pellegrino photo op. Who knew Lucifer could be so delicious…. At 1030 was a panel with Ruth Connell (Rowena), Osric Chau (Kevin Tran), Kim Rhodes (Sheriff Mills), and Briana Buckmaster (Sheriff Donna). I loved this panel. It wasnt all full of energy like the day before. It was more casual, sit down, have a small chat with a few hundred friends. Here’s some of my own pictures as well as the lovely Tiffany Fahy’s beautiful work. After this there was a little bit of down time for me. Don’t misunderstand…there were a LOT of things going on at the con. But I didn’t have any of the photo ops. So it was basically a good time for lunch. Cause forgetting to eat is dangerous…I mean have you seen me?! I really can’t afford to lose any weight. I’m practically invisible I weigh so little… (*end sarcasm here*). Lunch ends and it’s time for a step up in my anxiety. What do I mean by that? I mean it’s time for my Misha Collins photo. He’s a main character….Castiel…the angel. Holy Hell Sarah take a deep breath….don’t choke, don’t cry…get it together woman! All of these things running through my head while I’m waiting in line. Patiently…or not so patiently. He is even more amazing in person. He was VERY tired which I think you can tell by this photo, at least I can. He had said later he was up all night the night before and flew in early. That sounds SO awful and makes me appreciate him even more. He still came to hang out with little old me (and a few hundred of my friends). I know they get paid to go to cons but still, they don’t HAVE to go and they still choose to. I can’t express the amount of gratitude I felt at that moment. Also, his hugs are amazing! After this was Mark Sheppard (Crowley)’s panel. Everyone loved it. He was super snarky, sassy, and walks around the auditorium so people can get pictures-or let’s be realistic it’s probably because he gets bored easily ha! He was asked a lot of questions about Jared and Jensen and his sass towards Castiel on the show. Mark gushed over his new precious daughter. Who is super duper adorable (her name is Isabella). Also, he hinted, or out-right told the audience to ask Jared about a prank Mark pulled on him….because Jared’s ALWAYS pranking everyone else. He wouldn’t tell us what it was. Made us wait in typical Crowley-esk (<—not a word-so what?!) fashion! Below are some of my own pictures, as well as Tiffany’s and then a snippet of his answer to a panel question about who he’d pick as a sidekick. After this I hang out and watch music videos. There are lots of times between panels, or photo ops they play music videos where people take clips of the show and put it to a song. I’ve done some of my own before (yep… you’re right. I’m THAT girl. How do ya like me now?! *nerd alert* *winks*). Next panel was Richard Speight Jr. , Matt Cohen, and Rob Benedict. I love these guys so much and fell in love with them more and more over the weekend. They just make you laugh, smile, and razz each other the whole time. We heard about Kings of Con the new series Richard and Rob are doing and of course we had to talk a bit about Matt’s new role on General Hospital. I mean look at him, that body SCREAMS soap opera role doesn’t it?! hehe Here’s a couple pictures from that panel to drool over *hands you a bib*. He’s so wonderful, and his laugh is so contagious. I have LOTS of photos of his panel, but I’ll pick just a few of mine, and of Tiffany’s to show you more of this wonderful person I got to meet. After ALLLL of this, you’d think I’d be beat? Yep. Exhausted again. But guess what? The Saturday Night Special starts at 10:30pm. Hold up your pants for the next entry! You’ll laugh, you’ll definitely cry, and you’ll think holy crap all of this in ONE weekend?! The answer is YES! Till next time! Previous Post Are We There Yet?!?!? Next Post IKEA would be my own personal hell….